Dear Family, Well life goes on. We are so happy to finally get settled in and doing what we have been preparing for. It seems that it’s been two years of continually working for this day. We think of you often and hope you are all doing well. This is a section of our travels from when we got up at 2:30 am on Feb 20 2013 and were shuttled to the MTC to depart on one of the MTC tour buses they use for transporting missionaries from the Provo Missionary Training Center to the Salt Lake City airport, (about an hour trip ). We flew to Detroit and had an hour layover, half of which it took us to walk from arrivals to departures using speedy moving sidewalks. Then departed to Montreal. 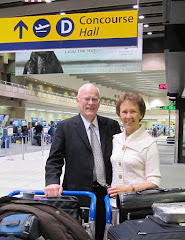 We landed in Montreal and were met by Pres and Sister Cannon who took us home and kept us for five nights. We purchased a van got it insured and registered on Thurs, had a zone leaders training at the mission home on Fri morning (9 TO 1), then picked up our phone from the mission office on Friday afternoon. We did some shopping on Saturday and went to church on Sunday. Driving in Montreal is good practice to be a taxi driver in New Delhi. It’s a nightmare. Monday morning we packed up and got out of that snowed in city. 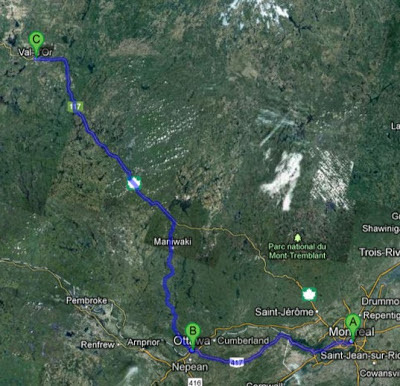 We went to Ottawa and were billeted at the home of the Stewarts for 4 nights, so that we didn't have to drive to Val D'or on Monday and back to Ottawa on Wed (a five and a half hour trip each way) for a Thurs zone study meeting. Finally we hit the road for Val D'Or on Fri after packing our van so nothing else would fit in with all the chairs, tables, desks, lamps and boxes of value village pots and pans and other treasures. We were billeted out to a beautiful clean and comfortable bed and breakfast home for the next three nights. I must admit that living out of suitcases and having to drive 20 minutes each morning and night to get to our apt was too much on top of the 3 months we had just spent in that situation. I announced that Sunday night was our last night to put off settling into our more permanent home quarters. Monday evening I had a bed experience that still has me shaking my head. After wearing myself out trying to pump up our new Canadian Tire 1/2 price, queen sized luxury bed, I gave up and looked for the instructions. It worked lots better after I removed a plug that fits to keep the air from escaping after it is blown up. At 11:00 am on Thurs morning, the day before our new Sears mattress and box spring was to be delivered we headed off taking the Elders and going to a place I haven't learned to pronounce yet, Rouyn-Noranda. It turned out to be 5 hours of travelling round trip. Well I’m back. It’s now 6:30 on Sunday afternoon. Going back to our trip on Thursday, we did 3 visits with members, one with a non-member, Anne, and then headed another half hour north to have supper with a sister who used to be in the East Stake and then moved to Cardston, Monica Chamberland-Roy. Two years ago she married and moved to Rouyn-Noranda. Supper was comparable to Christmas dinner. Then headed for home, a 2 hour drive in the dark and with wet roads. Not much fun driving curves and hills with those conditions. The Elders travelled with us because they can’t drive after dark on highways and we knew it would be late. Friday we had our bed delivered and got it set up, had our hour of French training with Elders Smith and Grant, then did visits to John and his mother, Richard, Yvette and her husband Jacob. Saturday we went out to Lac Simon, an Algonquin reserve, where we were invited again to have lunch with Kris. But this time the Elders were invited too. We got home and I worked on my talk for church tomorrow in Rouyn-Noranda. Next we went to the church building in Val d’Or to have pizza with the branch pres and his 1st coun who had just driven 5 hrs from Ottawa for church tomorrow. They drive up every 2nd week. Elder Smith who is 2nd coun in the branch pres., takes the responsibility of the meetings on the weeks they don’t come. Sunday morning, with one hour less sleep, we got up at 6:40am, headed out to the reserve at 7:35 to pick up Kris, Kerry and 3 others. All of them were sleeping and we had to wait for both Kris and then Kerry and gave up on the other three who didn’t answer the door. We headed out about 8:40 on our two hour trip to church in Rouyn-Noranda. All went well and we added Jacob, Yvette and Abbey to our load for the trip home. Got back home at about 4:00pm. Did some e-mails, studied French and found my lost car keys. (that’s another story). Monday was P-Day (Preparation Day). Mom did more cleaning. Today Tuesday we did some running around and then two visits with investigators the missionaries have been teaching. We hope to get in a routine to send more organized reports with less time in between. It has been challenging to get on our feet and at the same time try to get in several other routines. We feel that we are always a little behind with never enough time to catch up. We are however very happy to be here and feel it is a worthwhile effort. Enough said for now or you will never know that we are thinking of you and love you all. All that is left is to try sending this to everyone at one time. We can never count on our internet here at our apartment because it is a very weak signal and is free for all, but not at all times. Love to you all and we pray every one is doing well and is happy. Elder and Sister Rhodes / Ron and Tina / Mom and Dad. Hi, it's great to hear that you guys are doing well even though you completely detoured. Will you, at some time, still be going to Deli, and if so, is that going to extend your time away?